The Creta has been a dream for Hyundai and car buyers alike. It hit the sweet spot for most - someone who was upgrading from a hatchback, someone who was sick of a low-slung sedan, and also someone who needed a fuss-free loaded second car in the house. The concoction was just what the doctor ordered. However, hot new competition meant the Creta had to be on its toes, and find ways to become even more desirable. Has Hyundai made the Creta irresistible once more with the update? Among our favourite updates to the Creta are the new colours. The “Passion Orange” and the “Marina Blue” simply pop and scream for attention. 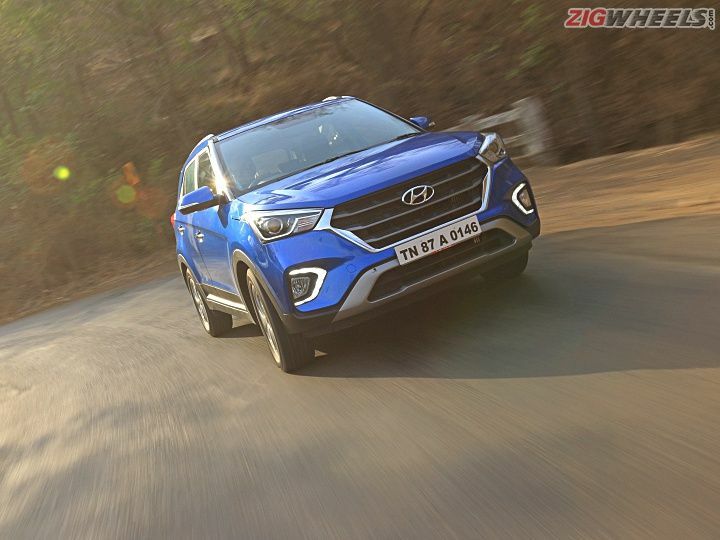 Compare that to the rather subdued palette the SUV was offered in earlier, and you can tell that Hyundai wants people to take notice of the new Creta. Because, if it wasn’t for the Poppins-inspired colours, the facelift Creta could go unnoticed. The updates are distinctive, sure. But, they don’t immediately catch one’s eye. The easier-to-spot changes include the bigger grille that makes the Creta look a tad bit wider than before. We particularly like the silver bezel around the grille — it really does help cement the “we-are-family” philosophy Hyundai is gunning for in its portfolio. Then there are the new headlamps. Yes, they might not look like it at first glance, because the shape remains identical, but Hyundai has tinkered with the detailing here. The headlamp no longer houses the daytime running lamp setup. That, instead, has been moved to the bumper, next to the now smaller fog lamp. It might look a bit aftermarket-ish to some, but it does meld well with the resculpted bumper. The other two profiles of the Creta haven’t been fettled with as much. You get new 17-inch alloy wheels wrapped in 215/60R17 tyres, same as before. Like most other manufacturers, Hyundai too has hopped on to the bandwagon and thrown in a sunroof for the Creta. While we’re not too fond of it for our climate conditions, there’s no denying the wow factor it brings to the table. It’s the usual electric sunroof with tilt and anti-pinch, nothing extraordinary to report about. The big benefit, though, is that it makes the cabin feel even more airy than it is. The unchanged dashboard is the only place where you’d find a splash of beige. The rest of the cabin, engulfed in black, looks smaller than it actually is. But, we can’t accuse the Creta for a lack of space. It’s not palatial, but it’s generous. The Creta isn’t as wide on the inside as you might imagine, but the tall roofline makes it feel a lot more spacious. At the front, the high seating position should hit home with a lot of buyers. While you can’t really see the edge of the bonnet, that high-set perch gives the driver extra confidence while negotiating heavy traffic. The addition of an electric-adjust for the driver’s seat is an added bonus — it lets you fine tune your driving position that extra bit. The steering continues to feature only tilt adjust, though. But it’s set at a neutral distance from the dash, and shouldn’t pose a problem. Hyundai has been a tad conservative in adding features to the Creta’s kitty. The sunroof and the powered driver seat are the only major additions here. Other minor updates include an auto-dimming rearview mirror (finally! ), a wearable key called the “H-Band” and a wireless phone charger. While the smart band is a sweet touch (that also counts your steps for you), the charging pad might be a hit or a miss. It draws power from the existing 12V socket in the dash, so, you can’t use your own car charger. You have to make do with the USB port. That said, it does miss out on a few goodies we’d have expected Hyundai to bundle in for the update. Features such as ventilated seats, automatic headlamps, and rain-sensing wipers are conspicuous in their absence. Not that it’d break a buying decision, but these are definitely feel-good features that one wants when they’re shelling out over Rs 15 lakh. Also, while we’re speaking of missing features, we can’t wrap our heads around why ISOFIX child seat mounts are available only in the automatic variant. It should’ve been standard across the range. For as long as I can remember, Hyundai has been winning the spec-sheet battles. With 128PS of power and 260Nm of torque on tap, the Creta diesel we have on test continues to be the most powerful SUV in its class. The only spec that’s changed is the fuel efficiency figure. Hyundai claims that the petrol is now more frugal by 3 per cent, whereas the diesel is more efficient by 4 per cent. On test, the Creta diesel manual returned a respectable 13.99kmpl inside the city, and an impressive 21.85kmpl on the highway. To add some context to those numbers, it wasn't as efficient compared to the Captur (15.50kmpl) inside the city, and nowhere close to the S-Cross' near unbelievable 19.16kmpl. Out on the highway, though, it bettered both, the Renault (21.1kmpl), and the Maruti (20.65kmpl) albeit by a tiny margin. Does it feel any different to drive post the update? Not really. It continues to be the friendly diesel it always was. Drivability continues to be the highlight here. You can actually feel the car tugging forward and accelerating if you upshift too early, instead of knocking and protesting. Life lesson? The numbers paint a very interesting picture. From a dead halt to 100kmph, the Creta is just 0.8 seconds shy of the bigger and more powerful Jeep Compass that takes 10.03 seconds. Notably, it’s a full 2.41 seconds quicker compared to Renault’s Captur. The engine’s ability to pull strongly from lower revs is amply evident by the fact that it’s just half a second slower compared to the Compass from 30kmph to 80kmph in third. Inside the city, the motor continues to be at absolute ease. In fact, you can get going from a standstill in second and trot about town all day in third. What makes the experience that much more calming is the balanced ride quality. Sure, it isn’t Duster-like I’ll-flatten-everything-in-my-path smooth, but it will rarely give you a reason to complain. It takes the sting out of bad, gravelly roads, and regains composure quickly even if you hit a bump at high speed. We’ve got no complaints as far as high-speed stability is concerned either. It remains rock steady at speeds Mumma asked you not to do. It’s this balanced nature that makes the Creta a great family road tripper in our books. Out on the highway, it’s got the legs to keep you entertained. If you can’t be bothered, it will sit at triple-digit speeds all day long as you want, and munch miles. The upside is, now you don’t have to bother modulating the throttle. It’s now equipped with much-asked-for cruise control, which simply works without a hiccup. That said, an actual digital read-out for the speed at which you’ve set cruise control would’ve been great. Let’s shift focus to what has been the Achilles heel of the Creta, the brakes. With the update, the pedal feel isn’t all that different. It still feels a tad spongy and not as direct as we’d have liked. However, you feel a more direct relation between your input on the pedal and the actual braking. That said, it could’ve been tuned to offer a stronger initial bite. Finally, if we could nitpick a bit, we’d say wind noise at highway speeds could’ve been a notch better controlled too. Also, the tyres tend to scream and howl if you chuck them into a corner with some zest. However, as the grip is sufficient, we learned to ignore the noisy tyres and continue driving with confidence. With the update, then, Hyundai has simply refined a package that already hit the sweet spot. The added features, the slightly better braking, and the improvement in fuel efficiency is all that the Creta needs for its second innings. While we could have asked for a bit more of the wow factor by way of LED headlamps and tail lamps, and higher equipment levels, Hyundai has made sure we don’t crib about it too much. That’s because, the pricing really sweetens the deal - especially for the value-for-money S and SX variants. Hyundai has simplified the variant range, bringing down the total count from seven to five. The S+ and the SX+ variants have been axed, with features being incorporated in the lower S and SX trims. Compared to the prices of the outgoing car, the S is now a whopping Rs 53k cheaper. The SX variant, on the other hand, is more affordable by Rs 8k in case of the petrol, and Rs 24k in case of the diesel. Yes, the SX (O) costs an extra half a lakh, but the added equipment easily justifies the hike. The only miss in the lineup, is that of a top-spec automatic, both for the petrol and the diesel. If Hyundai’s Creta was on your radar, you now have stronger reasons to consider it.